The first thing to do is to get familiar with the situation: How safe is it for pedestrians and bicyclists here in Santa Cruz County? 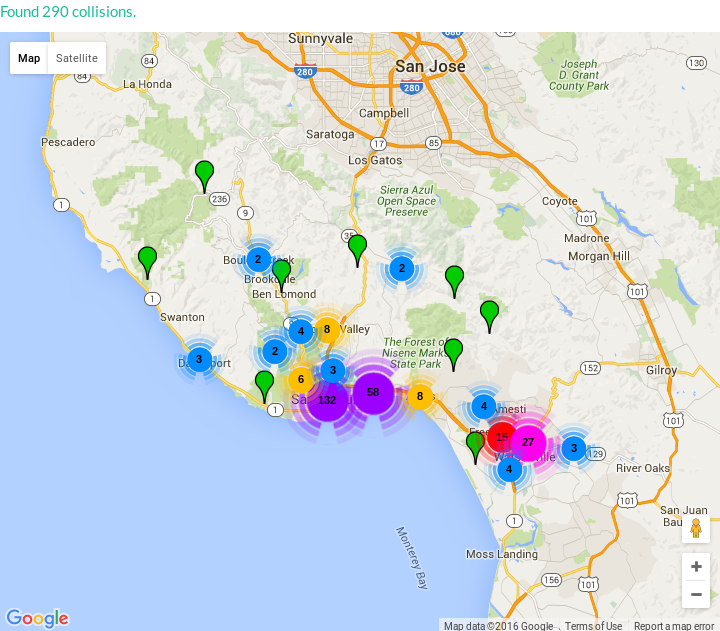 Steve Piercy has created an informative map that displays the Santa Cruz County locations of collisions involving pedestrians and bicyclists during any selected period of time in the interval between January 1, 2002 and December 31, 2015. It turns out that we are not safe. You can click here to see Piercy's map, but we suggest that to avoid confusion, you first read our hints below. When you first look at Piercy's map it will appear with its default setting, which looks only at the time period covering the full 2013 year, during which there were 290 collisions. You can zoom in on the map by hitting the "+" at the lower right of the map to get a more detailed view, or you can double-click on a cluster to expand to individual collision location details. Clicking on a green drop will pop up a window with additional details. To get a different time span, say the longest possible time span, click in the “Start Date” window, which should pop up a calendar. Then click the year button to select 2002 at the very top of the drop-down, and click Tuesday January 1 in the calendar. The Start Date should show “2002-01-01”. Then click the “End Date” window, and the year 2015, and hit the Thursday December 31 button. The End Date should show “2015-12-31”. Finally, hit the blue Search button, to see, after a few seconds, a new map, with all 3609 collisions. To restrict the collision types, say to display only those killed, hit the “x” in both the “Pedestrian Injured” and “Bicyclist Injured” buttons, and hit the Search button again to get all 68 collisions for those killed during this 13-year period. Further hints and technical notes by Steve appear below the map. Sometimes it may help to hit the F11 key to put the display in the full screen mode. It may also help to reload the page in your browser. This page was last updated on March 4, 2018.